저널명Trends in Plant Science. S1360-1385(17)30043-2. Cytokinins are phytohormones essential for cytokinesis and many other physiological and developmental processes in planta. Long-distance transport and intercellular transport have been postulated. 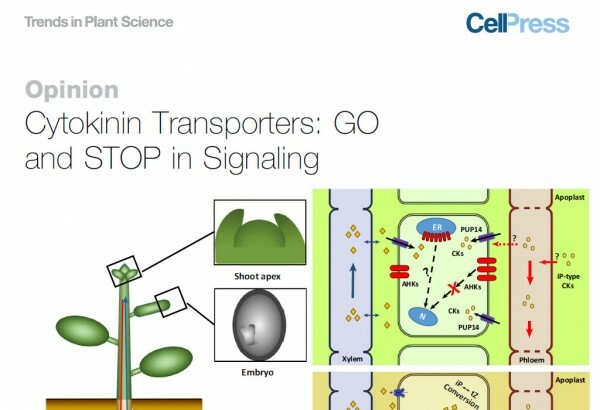 For these processes, the existence of cytokinin transporters has been suggested. Recently, a transporter loading the xylem (AtABCG14) and another for cellular import (AtPUP14) have been discovered. AtABCG14 participates in the xylem loading process of cytokinins and contributes to the positive regulation of shoot growth. The cellular importer AtPUP14 is required to suppress cytokinin signaling. A role of a transporter as stop signal is a new paradigm for a hormone transporter. 다음글Clinical and Genetic Aspects of the Segmental Overgrowth Spectrum Due to Somatic Mutations in PIK3CA.